There’s been a post brewing for some weeks in my head. It wasn’t even going in this blog because it doesn’t have a thing to do with Ireland, really. See I live in Oakland, California – which has been a hotbed of protests and riots for the last few weeks, all circling around killer cops and America’s lack of will to persecute them. My neighborhood has been full of buzzing helicopters, burning trash bins, broken windows, snarled traffic, bully police officers, and anger—a whole lot of anger. Throughout all of this, Ireland has been pretty far from my head, since I see this as an American failure. However, I am wrong in that. Racism is a problem everywhere. The North of Ireland has dealt with all of the things I listed above as and still does occasionally, as do many other places all over the world. When this picture came up on my radar I realized that there are people all over the world who are looking at this country with the same anger and incredulous horror that I am. 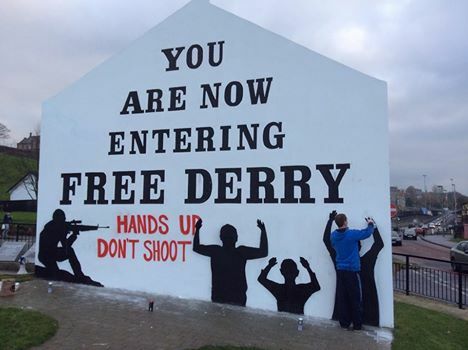 When the people in Derry posted this picture, my eyes welled up and I knew this post would go everywhere I could put it – even here. Still, this post really isn’t about Ireland. It’s about America and humanity. You see, America has serious problems. We have insidious race and gender issues that creep into every situation, every day. I could go on and on about the intolerance and cruelty that we as a nation inflict on other countries and ourselves but I won’t because it is a list that would stretch for miles and all of them boil down to one maddening thing. We don’t want to change or improve, ever. Bigotry, dehumanizing others, and racial profiling should have ended when our Civil War did, but it hasn’t. Hell, the Civil War still hasn’t ended in some places and minds and rather than trying to fix that, we ignore it. It’s the dirty secret in the corner of many American’s closets…and we shunt it aside or roll our eyes at the ignorance but we don’t really fight it. When someone points out valid instances of racially motivated killings, crimes, or ignorance, someone else is always there with a counter-statistic to either justify the action or to distract from the real issues. (See Fox News’ heavily circulated ‘black on black’ crime statistics that they roll out whenever any sane person tries to speak about white cops killing unarmed men.) White Privilege has become a buzz phrase that pisses people off and makes them defensive, rather than one that gets them to look at their world differently but it is a very, very real thing that most don’t even want to admit exists. I have been guilty of it too. I try to think of the world’s population as human, rather than label anyone by their race, gender or preference. I bristled the first night of the protests in Oakland at all the signs that said “Black lives matter” because in my opinion ALL lives do and singling out one race is just part of the same division that is used to separate us all. While that is true, I was wrong and naive to be upset. Racism is so prevalent in every single way that my life really does matter more in the eyes of this country simply because I am white. I’ve come to realize that my happy little label-free human party is dismissive because it takes all of the heritage, culture, and legacy of each tribe and throws it all right out of the window. It asks every person to ignore their struggles, their history, and their essence to band together and pretend that the discrimination and persecution isn’t still prevalent. It’s a willful blindness to the continuing ugliness of bigotry that trickles into economics, psychology, location, politics, and every other aspect of human life. It is a great idea that has served me well in becoming as colorblind and accepting as I am, but it is just as naive as the 4 year old child I used to be. These last few weeks, it has become pretty apparent that it is unfair to ask anyone to join me in my happy little mental state of a gender-free, colorblind human utopia. Why? Because I don’t know what it’s like to be pulled over every time I get into my car. I don’t know what it’s like to suffer injustice my whole life just because of the color of my skin or the faith I adhere to. I don’t know what it’s like to have my bag searched every time I step outside, just because I am walking down the street. I don’t know what it’s like to look at the flag of my country and feel like it has abandoned me and has been used as a symbol of my oppression for centuries. And I certainly don’t have to be too worried about being arrested, beaten, or shot by the police every time I leave the house. Other people do. Other people have been subjected to that and worse every single day. It happens in the North. It happens in far too many places in the world. I see it happen in my neighborhood all the time. My experience is so very far from theirs. Can I ask Michael Brown’s parents or Eric Garner’s wife to embrace my idealistic brand of humanity? Could Oscar Grant’s mother or Trayvon Martin’s family ever forgive the brutal deaths of their sons or the societal failures that led to their murders? Can Marissa Alexander stay warm in her prison cell knowing that there’s a hippyish woman in California who has an ideal world of acceptance in her brain that she wants the world to live by? No. These are the popular American cases, but there are thousands that simply don’t make the headlines. Stories of abuse, brutality, and murder that are based on skin color, racial bias, and sectarian divides happen all the time. Lying authorities, bogus stops, and planted evidence happen every day throughout the world. We vilify and demonize the victims in order to accept these atrocities when we should be criminalizing the behavior of the aggressors, especially when they are the police who should be held to a higher standard. Our American symbol of justice is a blindfolded woman who is balancing scales and holding a sword. It was meant to be a very powerful and inspirational depiction of a system that was meant to fight injustice and that did not see skin color, gender or creed. Instead it has never been more clear that the scales have fallen from their uneven weight and justice truly is blind to how skewed and corrupt of an institution it has become. That truth is that our country is just as bad as it ever was when it comes to racial relations, bigotry, and hatred. Our justice system is unjust, our police forces are corrupt and aggressive, and our society as a whole is not interested in changing. There is a palpable anger in the air here in Oakland. The atmosphere is charged and the people are all on high alert like I’ve never seen before. We are coming up on another week of protest, vandalism, and frustration, with no end in sight. I worry about homes and small businesses. I worry about the 2000 police in riot gear that were deployed a week ago to deal with a march that only had 200 people in it, who chopped a peaceful march into small groups that got angry and smashed windows. Aggressive policing causes aggression. The march had been peaceful before their tactics and they continue to employ them every single night, guaranteeing that the anger of the protestors continues to escalate. Uneven odds and heavy-handed infiltration like that are bound to only fuel the (literal) fires of frustration. Their military tactics and aggression are exactly what leads to death every day – and society’s silent approval of them is why America is in the state that it is. We are a racist country. We are a doomed one if things don’t change. I worry that things are going to get a lot worse before they get better. I worry that my neighbor’s children will grow up in a world that destroys them, if they grow up at all. Most of all, I fear that the constant death and brutal injustice will happen so frequently that it will crush us all under its weight. That our feet will tire and our indignant hands up in the air will become a shrug of the shoulders. That the anger will fizzle out and that nothing will change – leaving everyone defeated and dejected. That we’ll become so polarized and angry that we start fighting each other instead of the real enemy—a non-empathetic society that allows these things to keep happening to all of our perils. These thoughts are relentless as the verdicts (or lack of them) continue to pour in. Marching through the streets of Oakland in the middle of the night doesn’t really help. I know that. It helps my head. It teaches me about my own privilege. It shows me that the Black and Latino communities have actually come out too and that the protestors aren’t just white kids making a mess. It brings me a small relief from the overwhelming heartache that these last few weeks have wrought. It’d be better to be sitting on the steps of the courthouse when it is open, or to be stopping suburban commuter traffic during rush hour but until that happens, I’ll settle for writing to every politician I can, petitioning our Department of Justice to take over investigations, facing down the bully police and taking to the streets because business as usual must stop. It will take us all—no matter what color, gender, or creed—to make that happen. I have been angry at my country and remiss in thinking that it is an American problem. This societal failure is not just an American issue. Sectarian and bigoted speech is world-wide and all too common. The North of Ireland has had more than its far share, as have far too many other places in the world. Knowing that the people around Free Derry Corner—a place born of protest that has had just as many problems with militarized police and bigotry—are still capable of sympathizing on this is touching and inspiring. It reminds me that others in the world are watching us, and that helps me to keep hoping that someday my happy little world of label-free humanity can exist. The hippie in me needs to believe that it’s possible… but the realist knows that it simply can’t happen soon enough. We should all be better than this by now. Society needs to be truly integrated and empathy, acceptance, and equality should be the first things the children of the world are taught. Until that happens, we are spreading our own doom and encouraging the broken systems to keep on chugging. For me, here and now, business as usual is not an option. This stops today.